A dream doesn't become reality through magic. It takes determination and having the right person on your side dedicated to helping you achieve your goals. 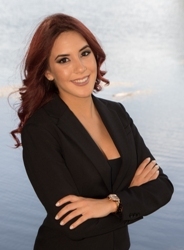 Vanessa Aparicio is dedicated to your real estate goals and as your Miami Lakes real estate agent you can count on her to always work with your interests in mind, and to represent you and your wishes to the best of her ability. Vanessa Aparicio offers individualized attention to all of her clientele as they were her only. You can contact her with any questions or doubts you may have and it will be her pleasure to put all your worries at ease. Buying or selling a home is a major decision that requires a professional with the knowledge of the Miami Lakes real estate market and specific tools necessary to make the process as smooth as possible amongst many other things. Vanessa Aparicio is your Miami Lakes real estate professional with the necessary knowledge and skills, she will handle all aspects of the transaction in order to remove the burden from you and make your life easier during the process. Vanessa is dedicated to your real estate goals.